Is Brussels dangerous? Has this thought ever crossed your mind? Well, it hasn’t crossed mine. I really thought that Brussels a lovely European city just like Amsterdam or Hamburg. How wrong have I been! I visited Belgium 1 year ago with my best friend, Kate, as part of our 16-day trip to Europe (check the post about the planning of our budget trip) through Netherlands, Belgium, France, Spain and Poland. Since we were limited by my Christmas study break and Kate’s annual leave, we only could spend 16 days abroad. Also, of course, we were limited by budget. We only assigned 30€/day per person (excluding transportation costs and accommodation, of course, otherwise it would have been a real hobo trip, which is quite dangerous in Europe in winter). We arrived in Belgium from Amsterdam by bus (the journey takes 3-4 hours depending on traffic, and the prices start from 1€ if you’re fast enough to buy the first tickets released by MEGABUS). Well, we had an evening, a full day and another full day in Belgium, so we booked a two-night stay in a hostel. We never actually thought, is Brussels dangerous or not? European capitals were always famous for their safety (not Paris, though). We chose the hostel because of the price/location value. We wanted it to be in a pedestrian proximity to the city centre and not more than 80€ per person for two nights. Our choice was: Gîte d’Etape-Auberge de Jeunesse Jacques Brel. Genuinely, I wouldn’t recommend you to choose this hostel. First of all, the location wasn’t nice: even though it was just 20-25 minutes away from the main square, it was surrounded by the most dangerous districts of the city. Yes, you’ve heard right. Brussels & dangerous in the same sentence. Brussels can be definitely not nice. Secondly, the wifi in the room didn’t exist, so it was only possible to surf the Internet from the lobby. The lobby, by the way, only had circa 5 chairs, and obviously, all of them were always occupied. Finally, the room was very old and not very clean as well as the shower was sort of broken. Actually, out of all my stays around the world, this one in Brussels made it to the top 5 nightmare hostel stays in my life. Feel free to read more about it in this post. On the first evening, we were tired as hell and just wanted to have some dinner and maybe walk around the beautiful Brussels just like we saw it on all the postcards. Unluckily, we managed to take a wrong turn and get to one of the most dangerous districts of the city. It wasn’t a pleasant walk, Turkish & Arab men were approaching us and telling us something in their language all the time, so we really wanted to get out there ASAP. As soon as we got a bit closer to the hotel, we slowed down. We were starving so we had to choose a place to eat, so we ended up in the most crowded kebab place. Not very Belgian but, at least, we wouldn’t fall asleep with the empty stomachs. 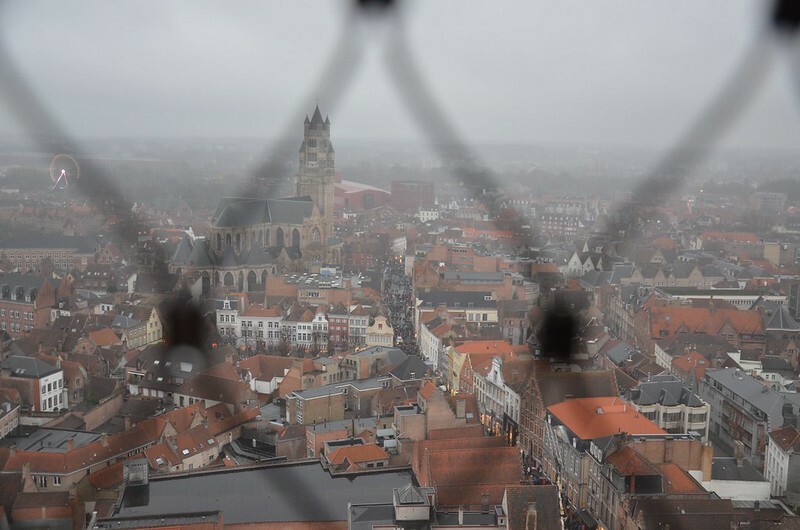 We didn’t have anything planned next day, so we decided to go either to Luxembourg or to Bruges. The decision wasn’t easy and after a long consideration, we decided to go to Bruges in order to see Belgium a bit more properly (well, 2 cities are always better than one). Getting to Bruges from Brussels is VERY easy. You just need to go the main Railway station and take a train from there heading to Bruges. The approximate journey time is 40-50 munites. Tip: Be careful with the trains: some of them aren’t express trains, so the journey to Bruges will take 2,5 hours instead of 40 minutes! Just like it has happened to us …. “But the sign on the train said Bruges … *sadly exhaling*. Despite the epic fail with the train, we arrived in Bruges in a good mood. 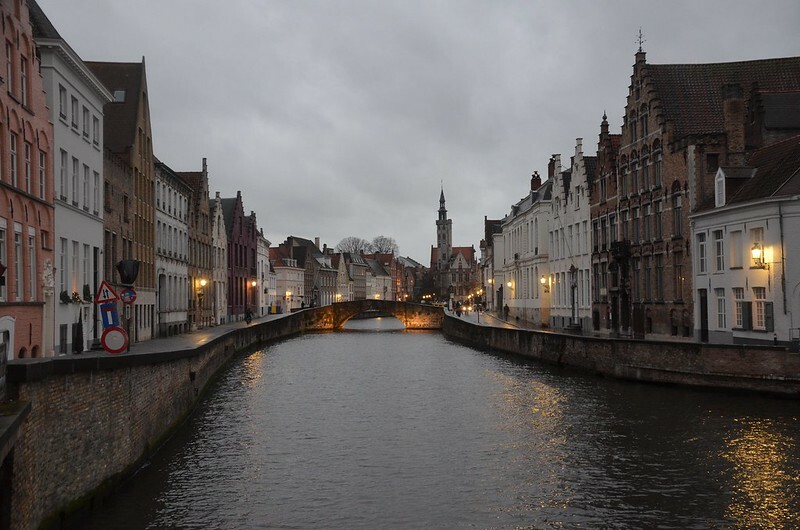 Actually, the main reason why I wanted to go to this city so much is that I had watched the movie called “In Bruges” some time ago, and there it was just so unreal. The city seemed so gloomy, negative and doomed but at the same time very unique. Well, in the reality Bruges is rather cheerful and mysterious than gloomy. But you know, when it’s almost Christmas Eve, depression disappears. The decorations were so lovely! 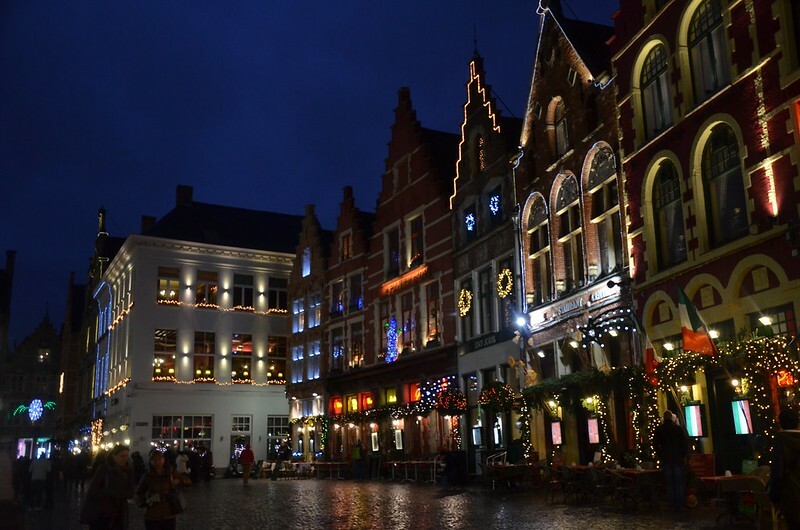 The city centre looked amazing thanks to the Christmas market located in the middle of the main square (well, not only because of the Christmas market of course, Bruges is a beautiful city in general). The main square was insanely crowded (well no wonder, it was the 21st of December! ), so we stayed in the queue in order to climb the city hall tower. Climbing was tough but the view was definitely worth it! Afterwards, we decided to walk around the city for a while and in the meantime find some nice local place to eat. We tried some but they all were full and with no sign of any guests leaving soon. It was already getting dark & cold so we decided to come back the Brussels (we still thought that the ride takes 2,5 hours, imagine our surprised faces when we arrived in Brussels in 45 minutes). It wasn’t that late, just the right time to continue our exploration of Brussels. We arrived in the main square, watched the light show (it was awesome! ), and again walked into a non-pleasant district by mistake. Well, again we were lucky and got back to the hotel safely. The next day was assigned to Brussels (but already at 7 pm we had to take a speed train to Paris). First of all, we went to see the Parc du Cinquantenaire, then encountered a hidden gem: some abandoned cathedral in the middle of Muslim district (it was actually very sad to see such an amazing Cathedral totally abandoned and in the process of falling apart), walked back to the Parc and took a metro & tram to Atomium. Well, I can’t tell, whether it’s worth going to Atomium at all because well, inside it’s not very impressive (according to my friends’ reviews) but it looks great from outside. On the other hand, it’s really difficult to get there. On our way back we went to see the European Parliament from the outside (because it was already too late): 5 pm so it wasn’t possible to get inside. So we walked all the way from Parliament to our hostel (so get the last impression from Brussels), grabbed our suitcases and went to the Railway station to continue our Europtrip in Paris. Maybe it’s just our bad luck but Brussels seemed like a dangerous city to me! There are too many immigrant zones and districts, which should be better be avoided. Moreover, Brussels was really dirty! So it was one of the biggest disappointments of the entire 16-day trip to Europe. If you want to see real Belgium, don’t expect to find it in Brussels (at least definitely not in winter). Later, I visited Brussels in May too, and again, experienced harassment in an off-licence shop. After that, I don’t really want to return to Brussels at all. What were your impressions? Maybe I was just unlucky? What do you think? Liked this post: “Is Brussels dangerous?” Spread the word and share it on Pinterest! Thanks for your comment, Susanna! I totally agree with you and the situation in Europe now scares me. It’s been a safe place but what it’s becoming now… I also was scared to walk alone in Germany, in Munich because my hotel was close to the main railway station & it wasn’t a nice experience. I’m sad to hear you had such a bad experience in Brussels 🙁 I was in Brussels a couple months ago and I really loved my time there! So … nothing actually happened, except that some brown men dared to talk to you? I’m sorry but I’m gonna call this like it is: that is is straight up racism. Immigrants/refugees aren’t criminals. You’ve based your fear entirely off of stereotyping. Refugees aren’t people to be scared of. They’re people in desperate need, whose homes have been destroyed, who’ve been forced to flee everything they’ve ever known with their families in the hopes that they might be able to survive. They’re people to be treated with empathy and compassion, not fear. Secondly, being Turkish or Arab doesn’t make you a criminal. Neither does speaking to you in a language you don’t understand. You really need to give yourself a cold hard look and examine WHY you’re so uncomfortable around brown men, and check your assumptions. 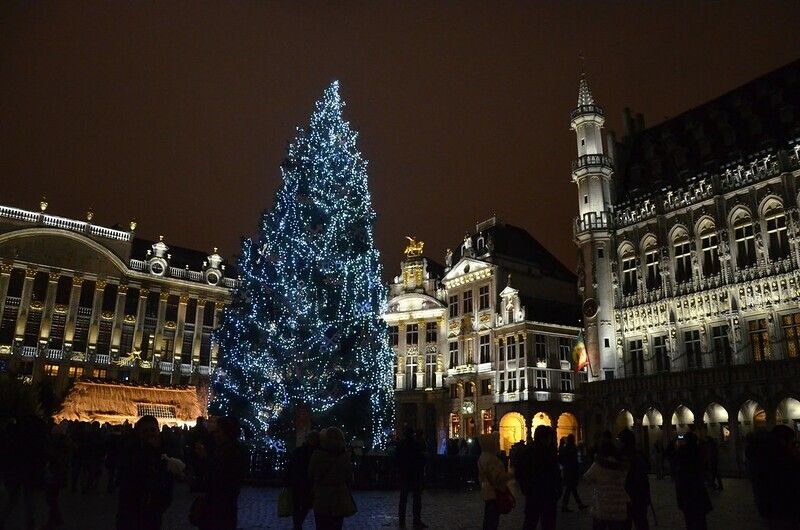 FYI, I was in both Brussels and Bruges last year during Christmas – at the same time as you – and I felt perfectly safe. 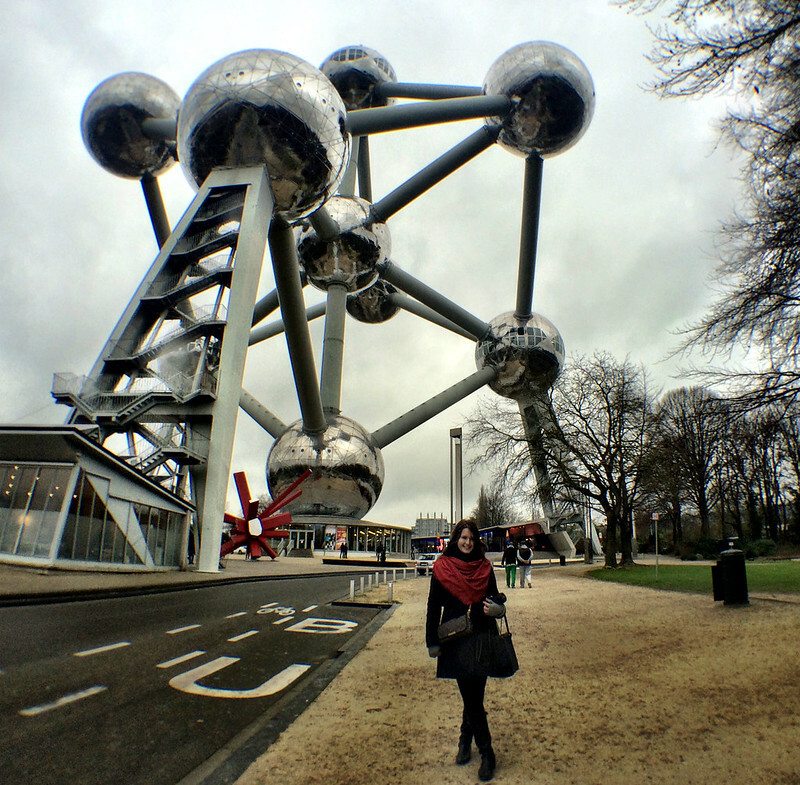 Brussels was actually one of my all time favorite cities that we visited in Europe. The people are HILARIOUS, the food is AMAZING, the history is FASCINATING, and the city center is BEAUTIFUL. I think if you visited again with a more open mind you’d have a much different experience! Hi Lia, so, you’re calling me racist? Such an interesting conclusion after reading the post where I was target of sexism and racism. I don’t mind immigrants at all, I’m an immigrant MYSELF, living in the most multicultural and diverse city in the world and I LOVE it. I absolutely LOVE Turkey and been to Middle East a couple of times and enjoyed it. I have Turkish and Arab friends too. And I also visited Brussels TWICE. Second time just because I thought I was wrong the first time or just unlucky, call it whatever. And the same thing happened. I was buying water in a 24 hour shop, friends stayed outside, but the guy at the counter was saying literally “mmm such a pretty girl alone outside, aren’t you afraid?” And staring at me non-stop. In order to feel harassed and objectified you need something to happen to you? So catcalling, staring, saying disgusting things is not enough?? Well, maybe if you enjoy it? I’ve got nothing to say here, but I thing it’s disgusting!